Iron is one of the essential minerals required for life. It helps to make enough healthy, oxygen-containing red blood cells. Without enough healthy red blood cells, the blood cannot transport enough oxygen around the body. Iron also helps the body to convert sugars into energy, and when there is a lack of iron available this process slows down. When the body cannot transport oxygen and make enough energy this is when people start to feel tired. This can affect all the bodies functions such as the immune system, brain function and nervous system. Unfortunately, the body does not produce iron and so it has to be absorbed from the diet. Those with an increased need for iron include menstruating women, growing teenagers and those who are pregnant or breastfeeding. Those who follow a restrictive diet, including a vegan or vegetarian diet are at higher risk of having an iron deficiency. However, anyone who does not eat enough iron-rich foods such as red meat, green leafy vegetables and pulses could also be low in iron. It is important to remember that the symptoms of tiredness and sluggishness don’t always indicate low iron levels and, if you haven’t already, it is a good idea to have a blood test to see if low iron is the problem. There is also a metabolic condition known as haemochromatosis, where iron accumulates in the body and is deposited in the organs leading to issues such as heart abnormalities, diabetes, and cirrhosis of the liver. One third of the Irish population carry the genes for haemochromatosis, and some of the earlier symptoms of haemochromatosis can be similar to those who are iron deficient, so it is important to rule this out before taking an iron supplement. There are a number of supplements available that can assist with boosting iron levels. 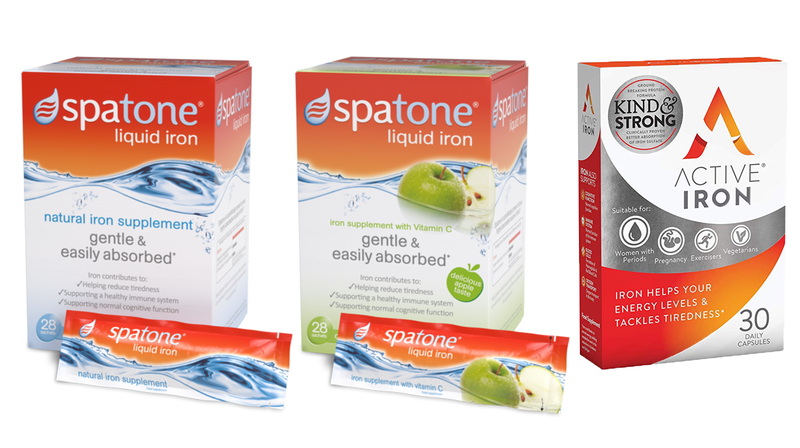 Spatone Liquid Iron is a naturally occurring iron supplement. It is packaged into single-use sachets which are ideal for use on the go or at home. Spatone has higher absorption which means less unabsorbed iron enters into the intestinal tract and so causes fewer side effects such as constipation than other iron supplements. Spatone can be taken straight from the sachet or added to water or fruit juice. Spatone Original is ideally taken diluted in fruit juice as these juices contain Vitamin C which increases iron absorption. Spatone Apple tastes great on its own and contains added Vitamin C for optimal iron absorption. Spatone is a great way to top up Iron levels, release the body’s natural energy and reduce tiredness. Active Iron capsules target the natural site of iron absorption in the intestine, increasing the amount of iron absorbed and making more iron available to your body. Taking one Active Iron capsule is the same as consuming 17 cups of raw Spinach. Its advanced protein formula is non-irritating to the stomach and does not cause inflammation preventing unwanted side effects such as stomach pain, cramp, sickness, constipation and flatulence. For more advice on iron or to find if iron supplements can help you, visit your local Hickey’s Pharmacy and speak to the Pharmacist.